Cloudy was Misty's first grandson, a striking palomino with a long white mane born in 1964. His mother was Wisp O' Mist and sired by a stallion named Lightning. Cloudy was Wisp's only foal as she died later that same year. When Cloudy was two years old, the Beebes sold him to Mr. and Mrs. Ed Clark of Clark's Corner. Since they had no children of their own they lavished a lot of love on the gelding. Ed taught Cloudy many tricks: to bow, to kneel, to rear up and pose like a statue, to give kisses, play dead, and to shake hands. Cloudy was also his master's drinking buddy and enjoyed a variety of beverages including beer, Coke, and Pepsi. Cloudy preferred Coke, which he liked to drink from the can. Cloudy was also known to "beg" at the backdoor of the Clark's home and even climb the steps to get a treat. Many of Cloudy's tricks have been depicted on postcards. 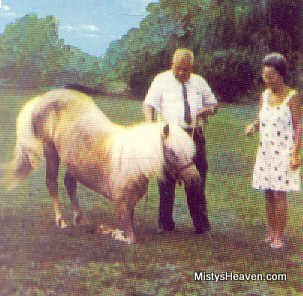 When Mr. Clark died in 1975 Cloudy was sold to Paul Merritt of the Chincoteague Miniature Pony Farm and rejoined the rest of his Misty relatives. There he continued to perform his tricks for the visitors of the farm. Cloudy appeared on many of the Pony Farm's souvenirs, such as postcards, plates, cups, and banners. Cloudy is written about and listed on the family tree in the Pictorial Life Story of Misty by Marguerite Henry. His picture also appeared in Wild Ponies of Chincoteague by Joseph Spies and Windy of Chincoteague by Ron Keiper. A vintage picture of Cloudy was in Out of the Sea: Today's Chincoteague Pony by Lois Szymanski. Cloudy spent most of the rest of his life at the Pony Farm. In the 1980s he had foundered badly and could no longer go out to pasture with his family members. However, he was given free reign of the barnyard where he still romped with the minis. Cloudy continued to perform in the Pony Farm shows and it was entirely up to him whether he wanted to or not. At the end of his life he was purchased by Mike Pryor and went to live at his farm in Waynesboro, Pennsylvania. Cloudy died sometime in 1990.